In 2007, Alice Saunders found a WWII-era duffel bag at a flea market and had an insight. A history major, Saunders focused her studies on World War II and Vietnam. As a hobby, she spent her winters sifting through old textiles at flea markets, barn sales, and antique stores and sewing them together to make something new. Then she found the duffel bag and the two interests came together. “My love for military history and those old fabrics, it was like, ‘Oh, wow, I can put all of those in one and make a bag,’” Alice says in Jay Carroll’s video for Levi’s Makers goods. That became her first Forestbound bag, which sold from her Etsy shop in February of 2008. Since then, Forestbound bags have been featured by name brands such as Levi’s, Anthropologie, Urban Outfitters, and Patagonia. Alice makes every bag by hand with the help of her friend Jill. Forestbound bags are mainly made with textiles from the 1920s through the 1960s, especially featuring military pieces like duffel bags, tents, and hammocks. In Jon Walley’s video series American Hand, Alice states that the textiles she finds and repurposes “encapsulate the history of those events and that time period in such a personal way because it tells a story of that soldier.” Finding the material and giving history a chance to tell its story and live again is of great importance to this former History major. Forestbound has grown into a company known for its durable, hand-made utilitarian bags, but Alice Saunders hasn’t forgotten why she began making the bags in the first place. Every bag has its own story made from its own unique materials, just like every soldier has his or her own story. 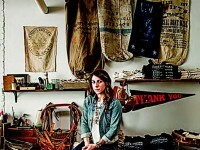 Alice Saunders has found a way to use her passion and talent to repurpose old materials and share a different story of history with every one of her customers. For more on products made from repurposed materials, read Take a Seat on a Coffin Couch, What’s a TerraCycle Brigade?, and Paper Made!